Every startup should have an origin story. Apple and its essential garage. The Wright brothers: two bicycle mechanics who invented one incredible flying machine. The genesis of the nontoxic Buckthorn Baggie starts with trees that refused to die. The common buckthorn, one of the most troublesome invasive trees in the Midwest, forms a dense thicket that crowds out native plants. Cut to the ground, it springs back, Hydra-like, with up to a dozen eager offshoots that form an equally appalling forest monoculture. Herbicide kills buckthorn, as does uprooting. But many people disdain herbicide, and uprooting fails on trees above an inch or so in diameter. Enter Buckthorn Baggies, an invention that University of Wisconsin–Madison engineering senior Matthew Hamilton cooked up as a high school student in Woodbury, Minnesota. The problem was simple: Buckthorn kept resprouting after Hamilton cut it back in his backyard. The solution was equally simple: a heavy, black plastic bag to cover the stump that was held in place by a cable tie. Within a few months, this patent-pending cure would annihilate the weed tree once and for all. The Baggie deprives buckthorn of light, preventing those nasty resprouts with neither chemicals nor heavy lifting. For example, since the bags need to remain in place for months, they needed a sticker to distinguish them from trash. But the stickers peeled right off, so he had to find a coating that improved adhesion. Invasive species are increasingly recognized as a major cause of environmental upheaval, and their removal is generally a key to ecological restoration. In the Midwest, common buckthorn is one of the worst invaders. The tree, apparently introduced to North America as an ornamental more than a century ago, quickly grows in a variety of habitats to 40 feet tall, with all the characteristics of an invasive nuisance. It tolerates the intense shade it creates. Its dense foliage emerges very early in spring, and lasts late into the fall, so it stunts the competition through sunlight deprivation. And when cut back to the stump, buckthorn produces half a dozen or more new stems. Far from solving the problem, cutting exacerbates it by leaving a phenomenally dense thicket. Although the stump can be killed by dabbing it with herbicide, many volunteer projects — and volunteers themselves — either cannot or will not use herbicide. And that’s a market opening for the Buckthorn Baggie. 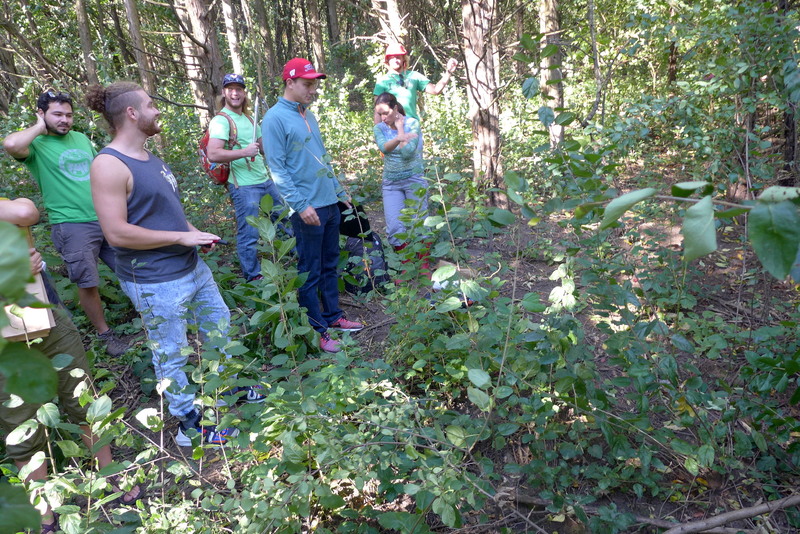 In the middle of October, the Baggies are solving that problem in a UW–Madison forest ecology class taught by Phil Townsend. The students are learning to measure tree biomass — an essential part of understanding the trees’ role in the environment, the carbon cycle and global warming. Sabo learned that the inventor was on campus, so Hamilton was invited to demonstrate how to place and secure the bags to deprive the stump of essential sunlight.